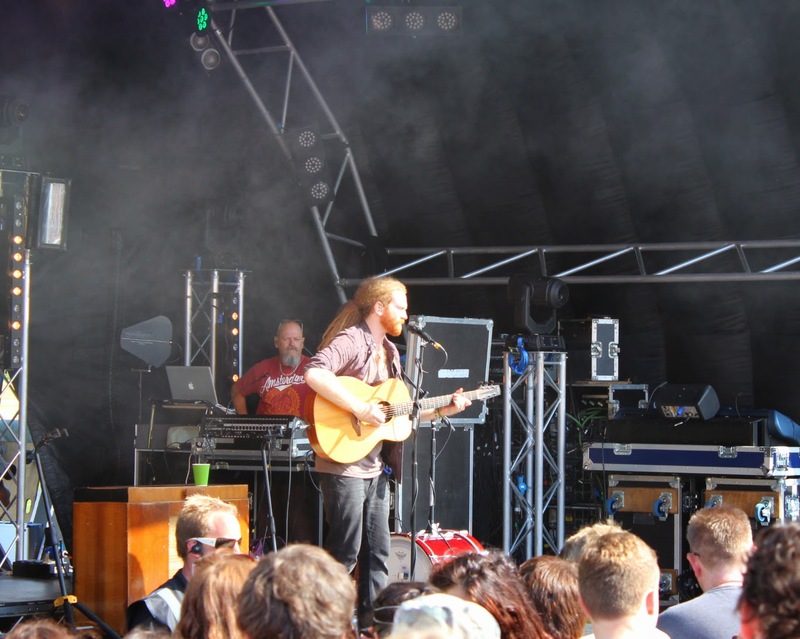 Without a shadow of doubt Newton Faulkner was definitely the most popular man at Behind the Castle and created a longer queue then at the bar for signing’s, hugs and free selfies. Straight from his acoustic set and hour of meet and greets, myself and Ollie Lucas from Folkgeek.net cosied up in the press hut with Newton and his very impressive mane of locks. Whilst Ollie asked the more pertinent music questions, I continued with my Heat magazine style Q&A which made for a fun and chilled out interview. Enjoy! As we’re here at the first ever Behind the Castle festival, what was the first ever festival you played at? Reading Festival was the first one I attended. And played at, I think it was Radio 1 Big Weekend, I can’t remember where, but we then went on to play at Glastonbury for the first time. So, what would be your festival essentials? Sun cream and toilet roll – or acquire some!! Any random or bizarre festival experiences? Yeah, moving a 30ft inflatable frog with Mumford and Sons at Oxygen festival was pretty random. I remember we re-inflated it at 5/6am in the morning, there was another band of guys in very skinny jeans, but can’t remember their names. Although I do remember their jeans were almost spray painted on they were that tight! Oxygen at the time was the last festival of the summer, so it was a big blow out for bands and spectacularly mental! Now for some quick fire festival questions…. Camping or glamping? Well, I’ve done a right mix from tents, Winnebago’s to tour buses. Wellies or flip flips? Wellies. I remember back at that very wet Glastonbury I had one of those yellow rubber fisherman style trousers and wellies on. I was dry as a bone. Be prepared! Where will we find you during the festival: moshing at the front, dancing in the middle, chilling at the back or at the bar? Dancing somewhere in the middle and a reasonable amount of time at the bar. Favourite castle? Hever Castle. It’s lovely and small. And finally, can you sum up Behind the Castle in 3 words? Civilised. Enthusiasm. See that’s two, does that count? I can now see why there was such a huge queue to meet Newton, he’s such a friendly guy we could have chatted all evening, but sadly he had to disappear into the sunset and head back to London. Check out my post from Behind the Castle festival here to read my review of the festival featuring the talented Seth Lakeman, Cara Dillon, The Levellers and Sheelanagig. Check out my interviews on Country Bumpkin Chic with Cara Dillon and Seth Lakeman. And check out Ollie’s interview with Newton on Folkgeek.net here.